Die grinder has unique 115° angle head that allows for easy shaping and finishing of dies or metals. Ideal for high-speed polishing and grinding. Has 1/4" collet. 18,000 RPM. Requires 3 cfm @ 90 psi. 1-3/4" wide, 3" high, 8" long. 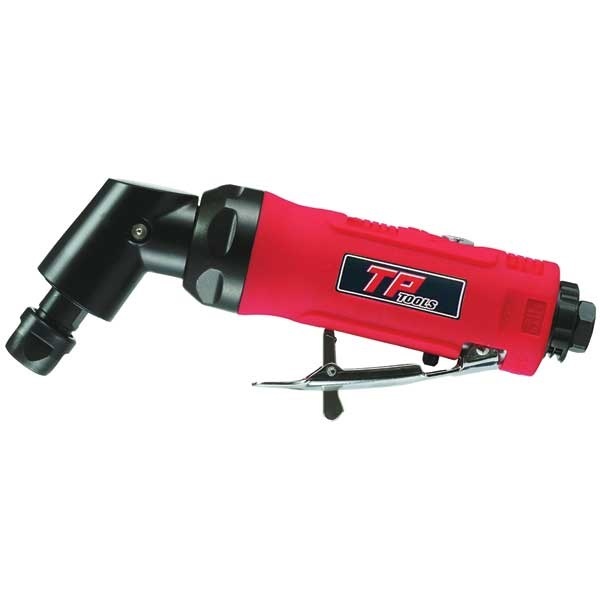 TP Tools® Professional Line of Air Tools is designed specifically for restorers and/or mechanics who take pride in their work and their tools. We've taken our years of experience with air tools, combined it with feedback from our customers, and applied both to developing our own line of air tools - manufactured to our specs, and using the latest technology to provide you with years of dependable service. Most air tools feature lightweight composite body with rubber or molded grip and vibration-reduction internal components, which reduce hand fatigue and provide even more comfort during operation. TP Tools® Air Tools carry a 1-yr warranty ... and won't break the bank - moderately priced without compromising quality! Imported for TP Tools®. Used to enlarge holes for taillights. Tool cuts quickly.